The marinade for this recipe is an old one of ours that we often baste a butterflied leg of lamb with before whacking on the BBQ on a hot summers day. Butterflied just means the bone removed so it is a flat piece of meat. A leg of lamb prepared this way is brilliant for cooking for numbers, it goes a long way, easy to prepare and quick and easy to cook – its not just for the BBQ, pop it in a very hot oven and 15 or 20 minutes is all it needs, along with a good 20 minutes of resting. With the bone removed it cooks quicker and is easier to carve, we slice it up with a good herby sauce and a crunchy salad. This recipe however calls for the shoulder, a cheaper cut of meat which lends to slow cooking. The shoulder is usually used in heartier, warming dishes for the colder months. But no reason why not to slow cook it so it is deliciously tender, soaked in flavour, and crispy on the outside, and to tear it up and serve it in a fresh salad. 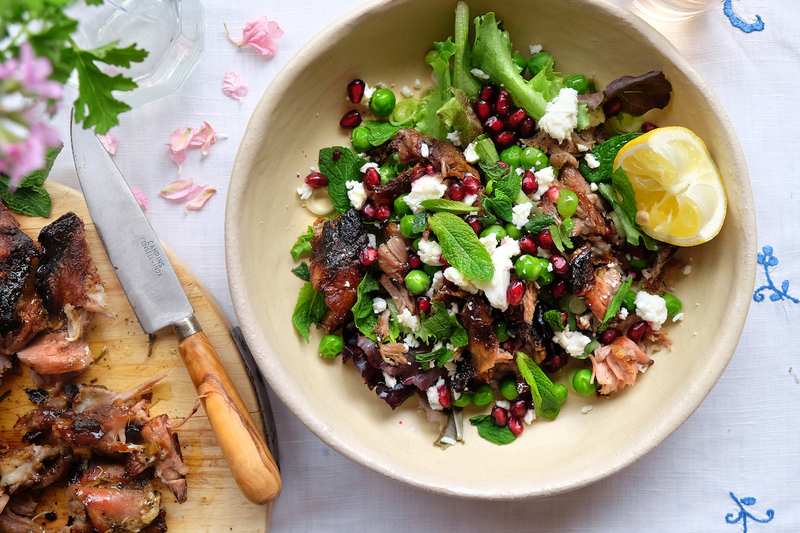 The flavours in the marinade are Middle Easton inspired then in the salad you have the sweetness of the pomegranate, the tanginess of the feta, the freshness of the peas and the mint. It makes a damn good Saturday lunch dish, or great one for dinner, and easy to multiply the recipe if needing to feed more. Perhaps serve it with a minty yoghurt. If you ware wanting to give this ago on the BBQ you don’t have to go as far as making into a salad, once it is meltingly tender and falling apart, serve it in buns with a good barbeque sauce and a crunchy slaw with lots of mustard, gives a nice change to pulled pork. 1. Mix marinade together (except for the wine) and pour over lamb. Leave for at least 3 hours, better still over night. 2. Heat oven to 170c. Put lamb in a roasting tin, pour over the white wine and cover with tin foil. Cook for 3.5 hours, remove the tin foil half way through cooking. 3. Take out the oven and leave to rest for 20 minutes. Using two forks shred the meat. 4. Blanch the peas by plunging into a bowl of boiling water for 30 seconds, drain. 5. Arrange the salad by scattering the leaves on a platter, sprinkle over the lamb, peas, feta, pomegranate seeds, mint and spring onions. 6. Whisk together the olive oil, lemon, honey and salt and pepper and drizzle over.